To Cite: Teimouri M, Khorsandi H, Aghapour A A, Jafari S J. Degradation and Mineralization of Malachite Green Dye in Aqueous Solution by Electro-Fenton Process Using Iron Electrodes, Int J Health Life Sci. 2018 ; 4(1):e79605. doi: 10.5812/ijhls.79605. The electrochemical degradation of a synthetic solution of malachite green (MG) was studied using electro-Fenton process (EFP) under batch conditions. The studies used iron electrodes to investigate the influence of operating parameters such as reaction temperature, distance between the electrodes, electrolysis time, and initial dye concentration. The values of 1 cm as distance between the electrodes and 50°C as temperature were found to be the optimum operating parameters for the efficient degradation of MG dye. When the temperature was greater than 50°C, H2O2 self-decomposed. After 30 minutes of electrolysis, TOC removal was only 76.5% when no H2O2 was added to the solutions (ECP), while the presence of H2O2 greatly improved TOC removal by more than 95%. For a solution of 1000 mg L-1 MG dye, degradation was complete after only 30 minutes. Furthermore, despite high removal efﬁciency of COD in EFP, energy consumption was less than in ECP. In recent years, the use of organic dyes in many industries such as textile, cosmetics, plastics, food, and leather has increased considerably (1, 2). By estimation, the production of dyes is over 7 × 105 tons per year and 10% - 15% of these dyes are given to aqueous environments (1, 3). These data show that the quality of water resource is strongly threatened since dyes not only give an unpleasant color to the waters but also, in some cases, can generate perilous by-products through reactions taking place in the waste phase (4, 5). Malachite green (MG), a cationic triphenylmethane dye, is used as a biocide in the aquaculture industry (6, 7). This biocide is highly effective against important fungal and protozoal organisms (8); it is also used as a dye for materials such as cotton, silk, paper, leather, and ceramics (6, 7, 9). MG is difficult to biodegrade and has toxic effects on human cells, experimental mammals and other aquatic animals (7). It may cause liver tumor, skin diseases, and even skin cancer after prolonged exposure (10, 11). Nevertheless, it is still used in many areas of the world due to its low cost, availability, and ready efficaciousness, and for lack of suitable alternatives (6, 7). Owing to its widespread use, MG can cause serious contamination to the environment (7). In recent years, several researchers have used advanced electrochemical oxidation processes (EAOPs) such as electro-Fenton process (EFP) to treat a variety of dyes (6). EFP can be divided into three classes depending on the purpose of current supply. The Fenton sludge recycling method uses electrical current to induce the reduction of ferric hydroxide sludge to form Fe2+. In the “EF-H2O2” method, ferrous ion is added from the outside and hydrogen peroxide is generated using an oxygen spraying cathode. 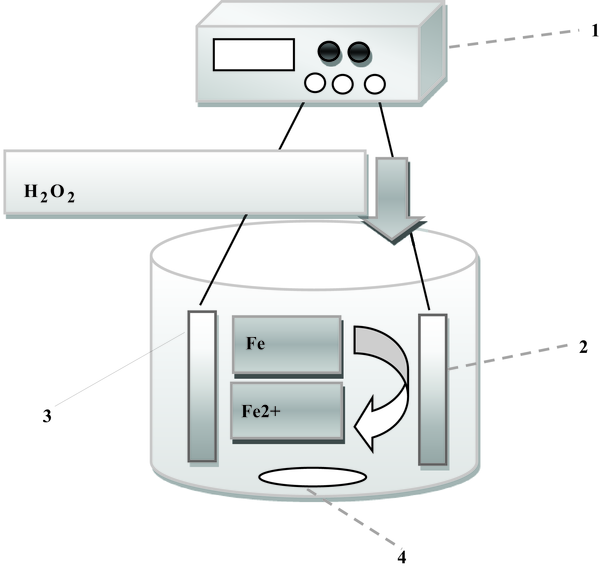 In the “EF-Fe ox” method, H2O2 is added from the outside while ferrous ion is produced by the oxidation of sacrificial iron anode. The last class is similar to the process used in this study (14, 16). To date, the degradation of MG dye has been conducted in various EF systems using different electrode materials. Table 1 summarizes these studies in the selected published literature. Accordingly, EF reactors have been operated in low concentrations of MG dye in order to attain sufficient removal efficiency. Thus, the main aim of this work is to investigate the removal efficiency of EFP using sacrificial iron electrodes for degradation of a high concentration of MG dye. In this regard, the effect of reaction temperature, distance between the electrodes, electrolysis time, concentration of MG dye, kinetic of the reaction, COD removal, mineralization efficiency and energy consumption of EFP and ECP were determined. Some experimental parameters were already optimized (pH = 3, current density = 10 mA Cm-2, CH2O2 = 50 mg L-1) and 94% color was removed under these optimum conditions for 200 mg L-1 of MG after only 10 minutes of treatment. Malachite green, chemical formula = C23H25ClN2, λ max = 618 nm, MW = 364.911 g mol-1, was purchased from Aldrich. A stock solution (5 g L-1) of MG dye was prepared in distilled water and diluted when necessary. The chemicals used in this study (H2SO4, NaOH, and H2O2) were obtained from Merck company. The electrochemical batch reactor was made of glass, 8 cm high and 5 cm in diameter, with a working volume of 250 mL. Two iron plate electrodes (i.e., one anode and one cathode) with measuring 60 × 40 × 2 mm were located in reactor. The total active electrode surface area was 10 cm2. The cathode and anode sets were connected to negative and positive outlets of DC power supply (PS-305D model; 30 V, 5A) respectively, which discharged electrical current into the mixture when needed. Before each experiment, in order to remove organic impurities and oxide layer active electrode surface area, were soaked in HCl solution (30%) for 5 minutes, and then rinsed with distilled water. In all experiments, a magnetic stirrer (Alfa, HS-860) was used (300 rpm) to create turbulence completely and ensure homogenous condition in the reactor (Figure 1). Where A0 and A1 are absorbance values before and after treatment process, respectively. Where TOCt and TOC0 (mg L-1) are the initial and final TOC of the solution, respectively (9). Where V is average cell voltage in volte (V), I is the applied current in ampere (A), t is the experiment time (hour), (∆COD) is the corresponding COD decay (mg L-1), and VS is the volume of solution (17). Where PH2O2 cons, H2O2 cons EFP, and H2O2 cons tem are pure H2O2 consumed in EFP, total H2O2 consumed in EFP and H2O2 consumed if the temperature is used alone. The highest amount of H2O2 consumed, if the temperature is used alone, is at 60°C equal to 22.8 mg L-1 but maximum and minimum amount of pure H2O2 consumed are at 50°C and 60°C, respectively (Figure 2). This result shows that at higher temperatures, H2O2 undergoes self-decomposition (Equation 6) (18). In a study by Hameed et al. (20) similar results were also observed. Hameed et al. (20) reported that MG removals percentage increased from 85.59 to 98.14% as the temperature increased from 30°C to 50°C during the first 10 minutes of the Fenton process. Panizza et al. (18) reported that the degradation rate of alizarin red dye increased when the temperature increased from 25°C to 35°C. 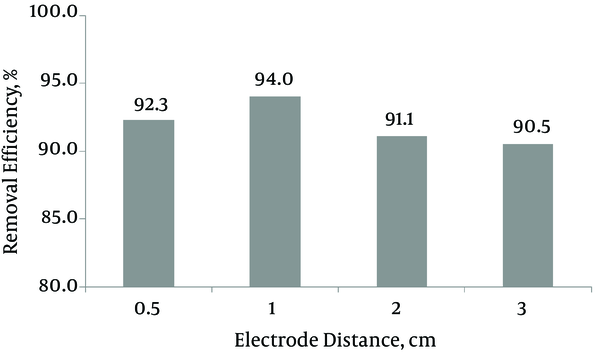 To investigate the influence of space between the electrodes on treatment efficiency, the experiments were performed at varying electrode distance from 0.5 to 3 cm. The results are presented in Figure 3. The MG removal percentages were observed to be 92.4%, 94, 91.1%, and 90.5% for electrode spacing of 0.5, 1, 2, and 3 cm, respectively. Accordingly, the maximum removal percentage was observed at 1 cm electrode spacing. By decreasing electrode spacing from 1 to 0.5 cm, MG removal efficiency also decreased, because anodic oxidation of Fe2+ to Fe3+ could occur when the electrodes were placed too short (21). The removal efficiency decreased as the distance between the electrodes increased up to 1 cm, because a longer distance between the electrodes can limit mass transfer of Fe3+ to the cathode surface which will govern Fe2+ regeneration (22). In addition, an increase in the space between the electrodes results in an increase in ohmic drop through the electrolyte and then an equivalent increase in cell voltage and energy consumption (23). Our results agree with data achieved in other studies, such as COD and color removal from synthetic textile wastewater by EF method (24) and removal of salicylic acid from aqueous solution by EFP (21). Zang et al. (25) studied the removal of COD from landfill leachate by EFP and showed that there existed an optimal distance range between the electrodes (1.3 - 2.1 cm) so that an over 7% higher COD removal was achieved than when the electrodes were positioned beyond this range. Thus, the distance of 1 cm was determined as optimum for the experiment. Figure 4 illustrates the rate of dye mineralization as a function of electrolysis time in the EFP and ECP. EFP efficiency was obviously higher than that of ECP. After 30 minutes of treatment, more than 95% of TOC was removed in EFP, meaning that almost all the organic compounds were entirely mineralized to CO2 and H2O while the mineralization efficiency of ECP after 30 minutes was 76.5%. As observed, EFP showed more mineralization efﬁciency over than ECP; the unselective attaches of hydroxyl free radicals and EFP’s high oxidation potential accounted for the higher mineralization power of EFP (26). Akyol et al. (27) investigated removal efficiencies of the liquid organic fertilizer manufacturing wastewater by EFP and ECP using iron electrodes. In their study, EFP resulted in higher removal efficiencies (81% of TOC in 10 min) than that of ECP (79% of TOC in 45 minutes). The energy consumption values in the EFP and ECP for mineralization of MG dye in different time intervals are calculated and presented in Table 2. Despite high removal efﬁciency of COD in EFP, the energy consumptions were less than in the ECP. For example, energy consumption in EFP was 0.0189 kWh g-1 COD after 30 minutes for 96.2% of COD reduction, while only 77% of COD abated consuming 0.0236 kWh g-1 COD in ECP. According to Hafaied et al. (17) energy consumptions were approximately 1 kWh/g COD when EFP was applied to treatment of Acid Red18 synthetic solution using a graphite-felt cathode (electrolysis time = 1 hours, initial COD = 56 mg L-1, COD removed = 30%, V = 250 mL, I = 250 mA). It has been demonstrated that a synthetic solution of MG dye at high concentrations can be effectively degraded by EFP using sacrificial iron electrode. Under optimal value of process parameters, 96.2% of COD removal was obtained after only 30 minutes of treatment. Under our experimental conditions, the total organic carbon measurements showed an efficient mineralization of 95.3% after 30 minutes of treatment. Moreover, it was found that despite high removal efﬁciency of COD in the EFP, energy consumption was lower than in ECP. Overall, EFP seems to be a clean and efficient method for the degradation of MG dye in wastewater. 1. Fernández C, Larrechi MS, Callao MP. An analytical overview of processes for removing organic dyes from wastewater effluents. TrAC Trends Analyt Chem. 2010;29(10):1202-11. doi: 10.1016/j.trac.2010.07.011. 2. Garg VK, Kumar R, Gupta R. Removal of malachite green dye from aqueous solution by adsorption using agro-industry waste: a case study of Prosopis cineraria. Dyes Pigm. 2004;62(1):1-10. doi: 10.1016/j.dyepig.2003.10.016. 3. Guenfoud F, Mokhtari M, Akrout H. Electrochemical degradation of malachite green with BDD electrodes: Effect of electrochemical parameters. Diam Relat Mater. 2014;46:8-14. doi: 10.1016/j.diamond.2014.04.003. 4. Ghoneim MM, El-Desoky HS, Zidan NM. Electro-Fenton oxidation of Sunset Yellow FCF azo-dye in aqueous solutions. Desalination. 2011;274(1-3):22-30. doi: 10.1016/j.desal.2011.01.062. 5. Oturan MA, Guivarch E, Oturan N, Sirés I. Oxidation pathways of malachite green by Fe3+-catalyzed electro-Fenton process. Appl Catal B. 2008;82(3-4):244-54. doi: 10.1016/j.apcatb.2008.01.016. 6. Bañuelos JA, García-Rodríguez O, El-Ghenymy A, Rodríguez-Valadez FJ, Godínez LA, Brillas E. Advanced oxidation treatment of malachite green dye using a low cost carbon-felt air-diffusion cathode. J Environ Chem Eng. 2016;4(2):2066-75. doi: 10.1016/j.jece.2016.03.012. 7. Singh S, Srivastava VC, Mall ID. Electrochemical treatment of malachite green dye solution using iron electrode. Int J ChemTech Res. 2013;5(2):592-6. 8. Srivastava S, Sinha R, Roy D. Toxicological effects of malachite green. Aquat Toxicol. 2004;66(3):319-29. doi: 10.1016/j.aquatox.2003.09.008. [PubMed: 15129773]. 9. Hashemian S. Fenton-like oxidation of malachite green solutions: Kinetic and thermodynamic study. J Chem. 2013;2013:1-7. doi: 10.1155/2013/809318. 10. Kousha M, Farhadian O, Dorafshan S, Mahboobi Soofiani N. [Investigation of the kinetics and nature of malachite green biosorption by green microalgae]. Water Wastewater. 2015;3:37-50. Persian. 11. Mirhasani A, Shahbazi A, Hasheminejad H, Sartaj M. [Optimization of the adsorption of malachite green on the NH2-SBA-15 nano-adsorbant using the taguchi method by gualitic-4 software an isotherm, kinitic,and thermodynamic study]. Water Wastewater. 2014;25(6):10-9. Persian. 12. Man LW. Design of experiments for Malachite Green dye removal from wastewater using thermolysis-coagulation-flocculation. Desalination Water Treat. 2012;40(1-3):260-71. 13. Rosales E, Iglesias O, Pazos M, Sanroman MA. Decolourisation of dyes under electro-Fenton process using Fe alginate gel beads. J Hazard Mater. 2012;213-214:369-77. doi: 10.1016/j.jhazmat.2012.02.005. [PubMed: 22381372]. 14. Babuponnusami A, Muthukumar K. Advanced oxidation of phenol: A comparison between Fenton, electro-Fenton, sono-electro-Fenton and photo-electro-Fenton processes. Chem Eng J. 2012;183:1-9. doi: 10.1016/j.cej.2011.12.010. 15. Wang CT, Chou WL, Chung MH, Kuo YM. COD removal from real dyeing wastewater by electro-Fenton technology using an activated carbon fiber cathode. Desalination. 2010;253(1-3):129-34. doi: 10.1016/j.desal.2009.11.020. 16. Anotai J, Lu MC, Chewpreecha P. Kinetics of aniline degradation by Fenton and electro-Fenton processes. Water Res. 2006;40(9):1841-7. doi: 10.1016/j.watres.2006.02.033. [PubMed: 16624370]. 17. Hafaiedh NB, Bellakhal N. Mineralization of synthetic and industrial food effluent containing acid red18 by electro-fenton process using a graphite-felt cathode. Int J Sci Res. 2013;6(14). 18. Panizza M, Cerisola G. Electro-Fenton degradation of synthetic dyes. Water Res. 2009;43(2):339-44. doi: 10.1016/j.watres.2008.10.028. [PubMed: 18996554]. 19. Wang CT, Hu JL, Chou WL, Kuo YM. Removal of color from real dyeing wastewater by Electro-Fenton technology using a three-dimensional graphite cathode. J Hazard Mater. 2008;152(2):601-6. doi: 10.1016/j.jhazmat.2007.07.023. [PubMed: 17707581]. 20. Hameed BH, Lee TW. Degradation of malachite green in aqueous solution by Fenton process. J Hazard Mater. 2009;164(2-3):468-72. doi: 10.1016/j.jhazmat.2008.08.018. [PubMed: 18804913]. 21. 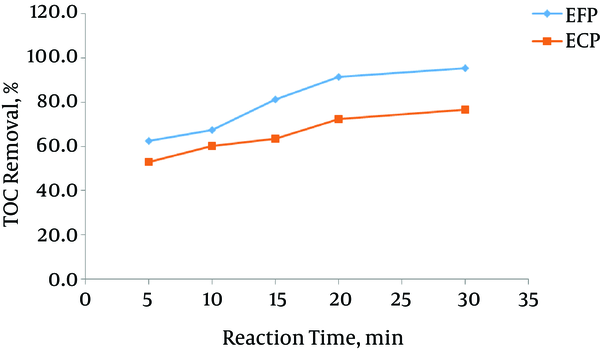 George SJ, Gandhimathi R, Nidheesh PV, Ramesh ST. Electro-fenton oxidation of salicylic acid from aqueous solution: Batch studies and degradation pathway. Clean (Weinh). 2014;42(12):1701-11. doi: 10.1002/clen.201300453. 22. Qiang Z, Chang JH, Huang CP. Electrochemical regeneration of Fe2+ in Fenton oxidation processes. Water Res. 2003;37(6):1308-19. doi: 10.1016/S0043-1354(02)00461-X. [PubMed: 12598195]. 23. Nidheesh PV, Gandhimathi R. Trends in electro-Fenton process for water and wastewater treatment: An overview. Desalination. 2012;299:1-15. doi: 10.1016/j.desal.2012.05.011. 24. Şahinkaya S. COD and color removal from synthetic textile wastewater by ultrasound assisted electro-Fenton oxidation process. Ind Eng Chem Res. 2013;19(2):601-5. doi: 10.1016/j.jiec.2012.09.023. 25. Zhang H, Zhang D, Zhou J. Removal of COD from landfill leachate by electro-Fenton method. J Hazard Mater. 2006;135(1-3):106-11. doi: 10.1016/j.jhazmat.2005.11.025. [PubMed: 16359785]. 26. Farhadi S, Aminzadeh B, Torabian A, Khatibikamal V, Alizadeh Fard M. Comparison of COD removal from pharmaceutical wastewater by electrocoagulation, photoelectrocoagulation, peroxi-electrocoagulation and peroxi-photoelectrocoagulation processes. J Hazard Mater. 2012;219-220:35-42. doi: 10.1016/j.jhazmat.2012.03.013. [PubMed: 22464981]. 27. Akyol A, Can OT, Demirbas E, Kobya M. A comparative study of electrocoagulation and electro-Fenton for treatment of wastewater from liquid organic fertilizer plant. Sep Purif Technol. 2013;112:11-9. doi: 10.1016/j.seppur.2013.03.036.